This dish is the ultimate comfort food! Delicious and at the same time nutritous, this is actually a pretty well balanced meal consisting of carbohydrates, proteins and also vegetables. Great for kids! 1. Get macaroni cooking in a pot of boiling salted water and cook as instructed on the packaging. 2. Prepare cheese sauce by melting butter, add in flour and cook for a minute in low heat before adding milk to get a creamy white sauce. mix in cheese and salt and put aside. 3. For the flavour mix, dice bacon and fry till crispy. Add in finely chopped onion, carrot, celery and garlic and salt and fry till softened. 4. Wash beans under running water, add into flavour mix and cook for a few minutes with a splash of water to get all the flavours together. 5. 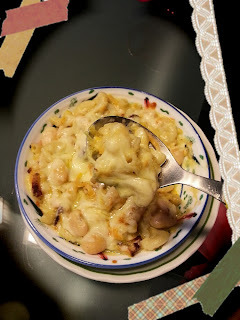 Mix cheese sauce and flavour mix to cooked and drained macaroni and mix well. 6. Serve as it is, or sprinkle more cheese over macaroni and melt it in the toaster oven.